Beach side spacious 1 bed apartment, sleeps 4 (1 double bed in seperate bedroom with aircon and seaview, double wardrobe and storage area. door direct onto terrace. The lounge has 1 new double sofa bed plus separate single fold down + cot + buggy + high chair if required (at small extra charge). I new easy chair with footstool. Enclosed winter terrace and open terrace. Sea views. Separate dining area with sea views. A/C, hot/cold. Security safe. Large walk-in shower. TV with international channels, English, Spanish, French,Scandinavian, German, Italian etc and DVD with selection of DVDs.-- FREE WIFI --Books and family games. Fully equipped kitchen with small fridge freezer plus another large family size fridge freezer in the utility room off the terrace, washing machine. Safe enclosed complex with 24 hr. security. Childrens play area, football area, Bar and snack bar. Direct access to the sea front Boardwalk, great for buggys, strolling or jogging. LONG WINTER LETS AVAILABLE, ASK FOR DETAILS. Enclosed parking. 2 large pools (the beach side pool is huge and is a salt water pool so no chlorine), lifeguard on duty in high season, large tropical gardens and summer bar area (great prices!) . Direct access to beach and Boardwalk. Walking distance to all facilities, 5 min by car to central Marbella. Ideal for families and for golfers. Winter long and short lets also available. Close to markets, Marina and shopping. Ideal central location and very well priced for beach side location. Personal meet and greet. Best priced apt. on the complex !!! All new and renovated Feb 2017. Beach and Golf : Ideal location for a beach holiday along with golf, there are several good top quality golf courses within a 5 minute drive from the property. Full information can be supplied on request. Check -in time after 3pm, check-out time 10am, or by prior arrangement, if nobody else is going in or out on the same day then it may be possible for you to stay till late evening for a very small surcharge. Free WiFi in the apt and also in a relaxation area on site and FREE children's club or dance club in July and August in English and Spanish....free of charge !!! (The children s club is not included in the price its a FREE extra, I cannot accept any responsibility if it is cancelled) . Really safe for kids, completely enclosed complex with 24 security. A swipe card is used for entrance and exit of the complex. and to the front door of the block. Large, newly refitted (jan 2017) wide walk in , non-slip tiled shower. Large mirror over sink with good strong lighting. Bathroom stool and scales. Plenty of clean towels plus beach towels available at no extra charge. hot and cold seperate unit, 1 for the bedroom and 1 in the lounge. the beds are made plus a spare set is left in the apt. there is a small fridge freezer in the kitchen and also a large family fridge freezer in the utility room. spacious kitchen with plenty of everything! covered terrace with large dining table and chairs, a sofa, plus a smaller table with chairs. there are 2 large pool areas 1 quieter pool and the other larger pool is overlooking the sea and is a salt water people so no chlorine. There is also a large dining area on the terrace which has a fold-back glass curtain for sea views ideal for evening meals at sunset, etc., also ideal as a winter sun room. Rental price of 7 days or more includes welcome food pack!! There are lots of extras in the apartment; Beach games, lilos, badminton, paddle bats, cooler box, beach bags, rubber rings, Beach towels etc. ! Apart from Free Wifi in the apartment there is a shaded chill out area onsite with free WiFi . Children's club Monday to Friday 11am to 2pm in English and Spanish - free of charge. (high season only)pending confirmation for 2019. There is also a childs pram/buggy high chair and cotavailable for a small supplement. Some emergency baby nappies are also included free of charge, upon request. We've just had a brilliant long weekend here and absolutely loved the apartment, the swimming pools, proximity to the beach, everything - such a perfect set-up. We'd love to return and spend a longer time exploring the area properly. Many thanks! Thank you. We are glad you enjoyed your short stay and hope to see you back soon. For longer next time! Spacious apartment with great view and nice host. Convenient for shopping, restaurants, and bars in the surrounding area. Secure building with nice surroundings. Having seen the property from the boardwalk earlier this year, we really set our hearts on staying there. From our first contact with Brian, everything went smoothly and we had a wonderful week there and he couldn't have been more helpful. The location is perfect for all amenities, beach, bars, restaurants, bus stop, supermarkets etc. and the pool area/bar is the icing on the cake. But check the months between October and April for Pool Bar winter break.The adjoining beachside restaurant is a must. The paella is amazing. The apartment was very clean and tidy and the balcony lounge was perfect for meals or just relaxing. Everything you would expect is supplied in the apartment. Not really much else to say except we would recommend you get your reservation in quick!!! Thank you guys. It was a pleasure meeting you both. Keep dancing! Highly recommend this property to anyone wanting a place that quite simply checks all the boxes. It was lovely to leave bedroom door open at night and go to sleep with the sound of the ocean. The pools are really nice and everything about the property is exceptional. I felt really safe staying here and was happy for all of the security. Brian is an excellent host and was very attentive to any needs we had. The welcome pack, delivered the morning after we arrived, was welcomed and a real plus. Thank you Brian for all of your help and suggestions. I only hope we can return and stay longer. Just returned from a 5 night stay at this property and I can't fault it. I stayed with my partner and our 2 children aged 8 and 10. It was very well equipped to suit all our needs. Perfect location with plenty of shops bars and restaurants within walking distance. Thanks Brian we will definitely be back. Not long back from this amazing complex. 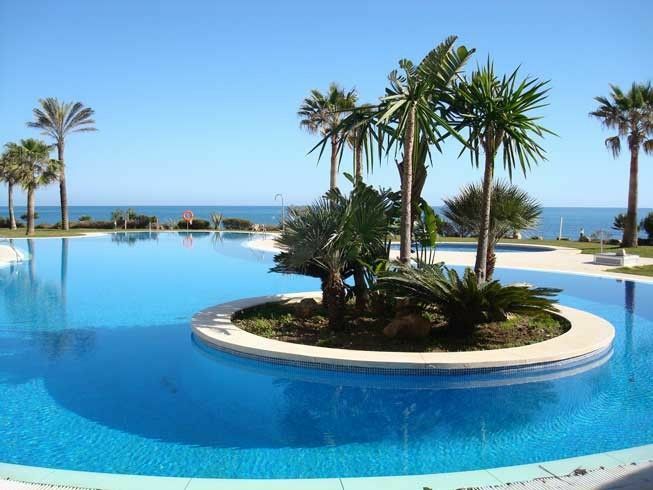 It has two fabulous pool areas with one being adjacent to the sea with beautiful garden areas . The pool bar at the complex is well priced and staff are very friendly .The property itself is very clean and well maintained . The kitchen is well equipped and there is plenty of towels , storage place for your clothes etc..The bed in the master bedroom is very comfortable as too is the pull out bed in the living area. The balcony area as a lovely dinning table and smaller sofa were you can sit it the evening and listen to the sound of the waves. This is our first time to the area and loved it . You are well within walking distance to all the restaurants and the main supermarket is just across the road. The bus stop is just outside the property making it very easy to get about. We definitely will be returning back here next year . Once again I would like to thank the owner Brian who was extremely helpful from start to finish and made our stay a very pleasant one. Walking distance to all facilities; beach, shops, supermarkets, night-life, 1 min walk to bus for Marbella (10 min) or Fuengirola (10 min). La Cala market (Tuesday and Saturday) is 5 mins away. There are several good golf courses in the area. It is possible to day trip to Cordoba, Granada and Seville. Winter skiing is approx 1.5 hr. drive. Coach tour to Gibraltar stops outside complex 12€ return on Fridays with English speaking guide. 3 large Supermarkets within easy walking distance. Lots of good restaurants and bars all within walking distance. Money exchange nearby. Medical centre just 150 m from complex. On site public telephone box. 24 security, lovely mature gardens, 2 fabulous large pools, childrens morning club in English and Spanish (when available), lifeguards in season. Bar for residents only with cheap food and drink. Direct access to the beach and boardwalk, wooded coastal path (approx 30 min walk), ideal for morning or evening stroll, ideal for prams and wheelchair friendly. Volleyball net. small enclosed football area. High security enclosed complex. Wifi areas. Underground enclosed parking. Lifts. wheelchair access throughout complex. Other Activities: Night-life is just a few minutes walk away, but the complex is very quiet. Cancellation refunds: up to 8 weeks no charge/ full refund. 4-8 weeks 50% refund. 2-4 weeks 25% refund Less than 2 weeks-No refund. Check-in time is after 3pm, check-out time before 11am, or by prior arrangement, if nobody else is coming in or going out then it may be possible to arrive or leave earlier or later. The confirmed rate is for the amount of people stated in the inquiry and quote. Extra guests will be required to pay a pro rata supplement. There is a 25€ amendment fee to changes made to an existing booking.